Hi, my name is Derek* (this is not my real name :)), and I am 13 years old. I will be 14 on the 7th of December. I am a Nigerian, originally from Sokoto State. I learnt about Fair Life Africa Foundation from one of my friends at Oshodi, who used to visit their Centre in August. I used to sleep under a bridge at Oshodi, and survived by working as a bus conductor and helping people to carry their load for small change. I remained on the street because I was scared of returning home. I thank God that Fair Life Africa accepted me as one of their children. I used to live in Ibadan, Oyo State, with my paternal grandfather and his wife. I went with support workers from Fair Life Africa to see them one day. My grandfather told them that I am an orphan, and that my mother died about four years ago, while my father died two years ago. My parents were never married, and I grew up with my maternal grandparents, though I often visited my mother regularly, until she died. Grandma took me to stay with my father’s daddy, because she thought that I was too much trouble. My grandfather is a retired military man, but he works as a taxi driver in Ibadan. I was fond of running away, and my grandfather was not surprised to see me that day. I started leaving home to stay on the street from a very young age. I have stayed at two other Homes before, run by different organizations, but ran away from them too. Nobody understands why I run. I know that I can be very naughty at times and I don’t like being corrected. However, I think that I am lovable and playful too. My maternal grandmother and grandfather visited last Wednesday and brought rice, beans, eggs and banana for us, and also gave me N200! My father’s daddy said he will come soon. He said that he wants my step-grandmother to come with him, but she has travelled outside the state for business. I know it wasn’t easy for Fair Life Africa to take me in. I have been in other Homes before, and I even used to fight a lot when I started visiting the Centre. There was one time that I fought with another child on the street on our way back to Oshodi, after our visit to the Centre. The support workers found out and didn’t want me to come back. But I begged for another chance and promised not to fight again. It hasn’t been easy, but I am happy to say that since they gave me another chance, I haven’t fought with any of the boys in the Home. I can see that I am changing, and I have Fair Life Africa to thank. I am going to a local primary school now. I wish that I was in Junior Secondary School, but because I didn’t stay in school, I don’t know enough to be in JSS1 😦 I am in Primary three again, and I am doing well in my class. I want to improve so that I will move higher next year. I would rather go to school than learn a vocation. I dream of being a lawyer when I grow up. Can you believe that I won the good behaviour competition in the Home? I got 18 (5 gold stars and 13 silver) points, and my best friend, who came second got 12 points!! We both stay in the “white room” (they used to call it “small boys’ room”, but the boys in the “big boys’ room” started to feel like big boys, so their room is now the “green room”!) I am the leader of my room, and I like to keep it smelling fresh and clean. We take turns to clean our bathroom, and I always make sure that we make our beds every morning. Mummy (Ms Ufuoma) asked me what I wanted for my reward, and I told her that I want to go to Silverbird Galeria in Victoria Island, Lagos. I have always wanted to go there to play and watch a movie, and had never been. She said that I could pick who I wanted to take, but I couldn’t decide between two good friends, and she agreed for both of them to come with me. It was a really wonderful experience, and I am so happy that I won! We ate candyfloss and popcorn, had soft drinks and small chops too! I drove cars at the arcade, by the cinema, with my friends, and then we watched a funny action movie on the big screen. It was called ‘Premium Rush’, and was about people who ride really fast on bicycles. 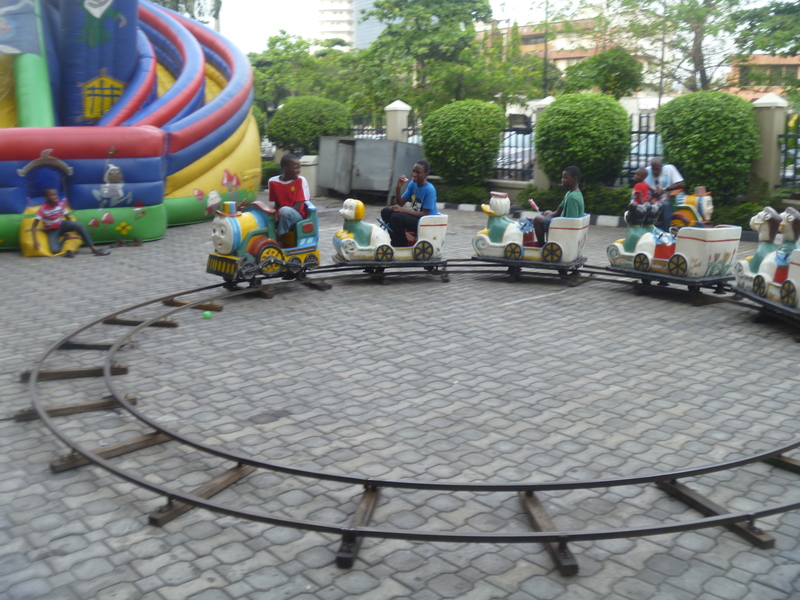 We also rode the toy train outside, even though Mummy and Brother Toju kept saying we were too big to ride. Before we left, I bought myself a deodorant spray, with Mummy’s help. I haven’t had many options and I have made some really bad decisions. But I am glad that when I had the option to follow Fair Life Africa, I did. I am also happy that they forgave me and gave me a second chance. I really want to change, and I want to learn too. I want to become somebody one day. Someone that can help somebody like me. Please help Fair Life Africa to continue to help children like me to get back to the straight path, and give us hope for the future. Thank you. Next Post November’s Newsletter is Out!! wow, we all need to help less privileged kids like Derek because it could have been me in his shoes…we need make others enjoy a bit of what we do, that way God gives us more! Beautiful story. High 5 Fair Life! It’s Derek’s birthday today!! Happy Birthday, Derek! !